Maple Roasted Small Potatoes make a great little side dish that is effortless, simple and delicious. A great addition to the Holiday table or served with a roast on a Sunday night. One pan and easily prepped ahead of time. 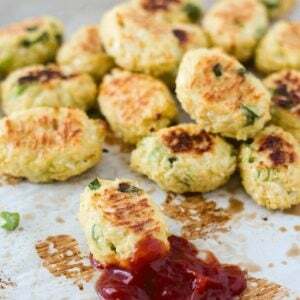 Everyone needs a quick and easy side dish in their repertoire that requires minimal effort but will still taste great and look kinda fancy…like you made an effort. Especially when it comes to the Holidays or a nice Sunday dinner when you have a thousand different dishes going at once and no time for messing around. What Ingredients Are Needed for Maple Roasted Small Potatoes? This little recipe ticks all the boxes. Mix it all together, chuck them in the oven, pop on the timer and you are ready to move on to the next dish. See, told you it was easy. Looking for some more sides to add to the table? I have plenty. And of course, you are going to need some mashed potatoes too. I mean you just cannot have a feast without some mashed potatoes, it just wouldn’t be right! How Can I Prepare Maple Roasted Small Potatoes Ahead of Time? 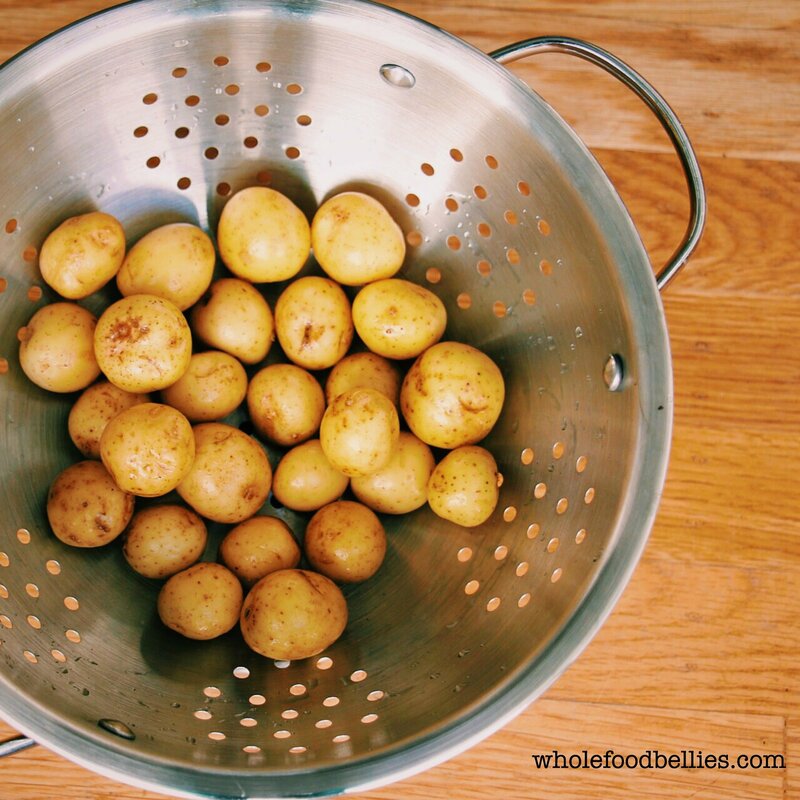 If you are into prepping beforehand, go ahead and chop the potatoes, pop them into the dish you will be using and pop them into the fridge covered. Mix the dressing ingredients together in a small glass jar with a lid and pour that on top just before you put it into the oven. Even the time-poor cook can still make an impression and put something great on the table. Wow these potatoes look amazing! It looks like the perfect side on a holiday table. Pinning to try later! Wow! These potatoes sound amazing. LOVE that there’s maple in this recipe. I’m definitely intrigued. YUM! I love roasting baby potatoes but I’ve never had them with maple.I bet they’re super delicious. The hubs is a meat and potatoes kind of guy and now that’s it’s the fall season, I’m slowly introducing them into our meals again. 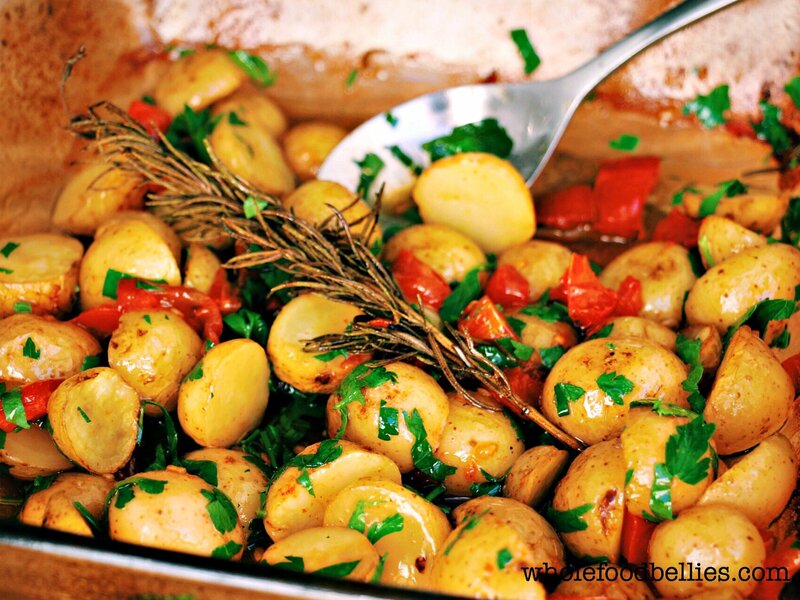 We love to make rosemary chicken and these potatoes sound divine and rustic! I love the addition of maple syrup to these roasted potatoes. And they are so easy to prepare! Great recipe! 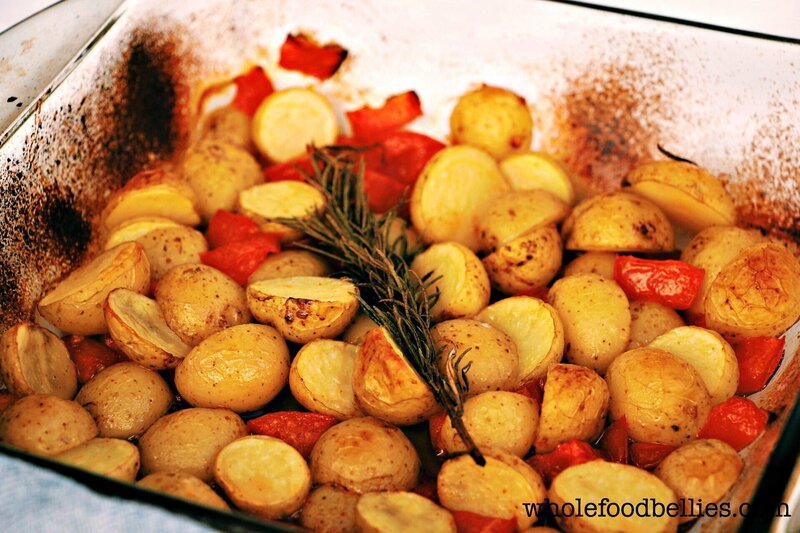 Cozy, hearty side dish perfect for the weather! The sweet maple with the rosemary sounds really delicious. Now these potatoes sounds sooo perfect. I love addition of syrup and rosemary. I bet this taste amazing. I can’t wait to try this. I’ve roasted butternut squash with maple syrup, but never potatoes. This is such a great idea! I love the addition of rosemary, too – yum! 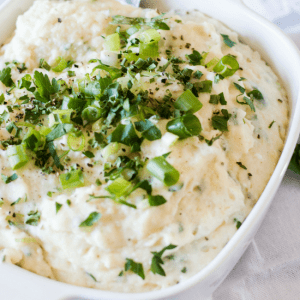 its always good to have an easy side dish recipe that comes together super quick… especially for the holidays. Im making a chicken this weekend and I think it will pair beautifully with it! Oh my goodness… yes please! 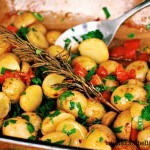 I love small potatoes and your combination of maple with the paprika, rosemary and parsley? Amazing! 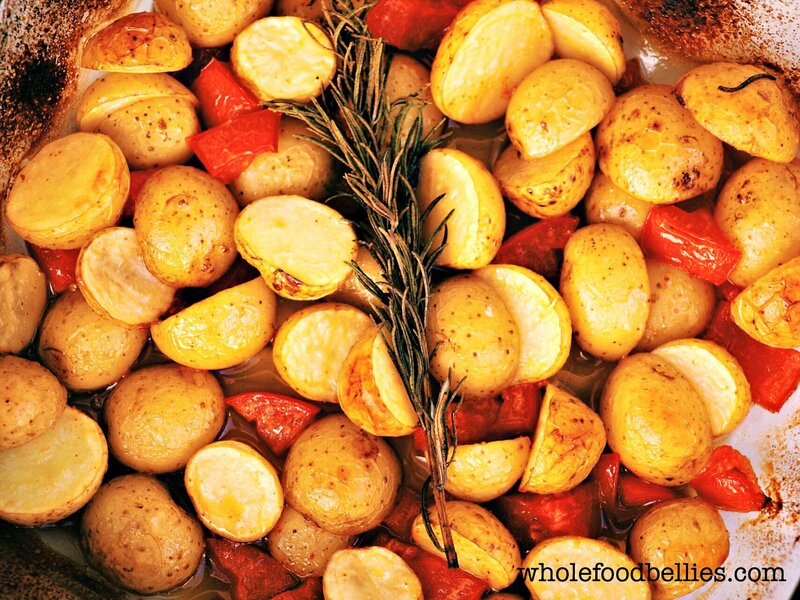 I would have never thought to add maple syrup to roasting potatoes, but I bet they are lovely and very fall centric. I can’t wait to try them this way. These look seriously delicious, I am pinning this one! Wow, what an epic recipe. I am definitely trying these. I love maple syrup but had never really thought of it with potatoes. This strikes me as a really sophisticated nod to patatas bravas. I hope you do Ben! Yeah I used the maple syrup on a whim and it worked well so I am going with it 🙂 Thanks for stopping by! I love small potatoes. They taste so good and Im always looking for new ways to cook them. Love this idea of using maple syrup! Thanks Julia! The maple syrup works wonders, so good!! These look delicious!! I love maple syrup and I LOVE potatoes so the combination interests me. Found your awesome blog through the Mom Bloggers Club on Facebook.